2001 marked the year that Toyota gave the world its first mass-produced hybrid vehicle, and it turned out to be better than originally expected. The Toyota Prius is one of the most popular selling cars today. Thanks to perseverance and dedication by Toyota, the Prius has only gotten better, and has evolved time and again to remain the leader of the hybrid pack. It wasn’t easy for the Prius to gain that leadership, especially with the rocky start it experienced here in the U.S.
By 1999, the Prius had experienced some success in Japan, but it was nothing mind blowing. Even so, Toyota decided it was time for their hybrid champion to be released in the U.S., and this hasty conclusion almost proved to be disastrous. The initial testing in the US was kept to a few drivers, and those drivers were not impressed with the Prius. Coupled with the fact Toyota was told there was no future in the American market for a car like the Prius, it almost shut down the global expansion right then and there. Disheartened, Toyota took their fledgling back to Japan and decided it was time to make some improvements. They needed to figure out how to appease our horsepower cravings while still keeping it fuel-efficient, which was its main selling point. In response, Toyota gave the Prius a redesign with a lighter frame. On top of that, Toyota needed to get the Prius to a marketable price so that the U.S. branch could actually move it on the market. After many negotiations, this demand was finally met and the Prius was introduced to the American market. Compared to the other cars on the market, it was still performance lacking. It took the Prius 13 seconds to get from 0 to 60 mph, whereas the average car on the market could do it in 10 seconds. Since this was the first time the world had seen an electric-gas powered hybrid, the drivetrain technology was still a little funky. The transition from electric to gas powered was not very smooth, and buyers knew it. Even with all those issues Toyota must have done something right, because the Prius caught a second wind and was far surpassing the number of sales Toyota estimated in the first year. This is thanks in part to the stellar EPA rated estimates for that year, which blew all the other cars out of the water. This adaptability of the car would be proven yet again in 2003 when it got another redesign. Toyota brought it back to market as a much more fashionable looking vehicle, which is exactly what American consumers wanted. The Prius was able to provide the same amazing 42 mpg city and 40 mpg highway (41 mpg combined) while sporting the same engine. The 2001 model Prius had a 1.5-liter DOHC 16-valve VVT hybrid engine that put out 98 net horsepower and 82 pound-feet of torque. Still a little slower than other cars out there, but it isn’t supposed to be a hot-rod. What it was supposed to be was fuel-efficient, and it was still crushing the market because of it’s EPA fuel-efficiency ratings. What also contributed was its ability to produce very clean emissions, even when compared to the other few hybrid cars on the market in 2003. The other cars out there were receiving ratings by the EPA like LEV and ULEV. While the Prius earned the rating of a Super Ultra Low Emissions Vehicle (SULEV) making it the cleanest vehicle in the 2003 market. In 2004, the second generation of Prius began. Toyota upgraded it yet again to further please American consumers by giving it even more fuel mileage, a better drivetrain, and giving it more space. The funky drivetrain was replaced with a better one to give the Prius increased performance and eliminate the kinks in the older system. The Hybrid Synergy Drive power plant was made up of a 1.5-liter gas engine and a single drive electric motor. The gas engine now produced 76 horsepower and 82 pound-feet of torque, next to the electric motor that produced the equivalent of 67 horsepower and 295 pound-feet of torque. The net horsepower was increased to be 110, giving the second generation a new time of 10 seconds when going from 0 to 60. With the upgraded system, it was also able to get better fuel mileage as well. It now reached an astounding 48 mpg city and 45 mpg highway, giving it a grand combined total of 46. Five more mpg than the first generation, and yet again proving to be the best in terms of fuel-efficiency on the market. Thanks to the increased drivetrain, it was also able to produce 30% less emissions than its predecessor, making it even greener than before. If that wasn’t enough, Toyota gave the second generation another design overhaul. This allowed for much more increased cargo and passenger seating room. While it was still nothing extravagant compared to the size of other midsize sedans on the market, it could now be considered a legitimate midsize family sedan. The Prius now had almost nearly as much trunk room as the Camry of this model year, and even taller passengers were able to fit in the backseats with ease. From 2004 until 2010, the Prius saw the same improvements that it always has and will see: the improvements Toyota knew consumers wanted. 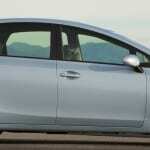 In 2010, the Prius went through a complete redesign, with performance as the focus this time. It was outfitted with a new engine, improved steering, handling, fuel-efficiency, drivetrain, and even a new platform. The Prius now shared the same platform that was used on the Corolla, making it feel more stable and secure than ever when going down the road. A 1.8-liter inline 4 with VVT now replaced the 1.5-liter that had been used since the first generation, and that was the main factor in improving fuel mileage as well. This new engine hit 98 horsepower with 105 pound-feet of torque, producing lower rpm’s than the last engine in the model lineup. The reduction in RPMs was the key to the Prius hitting a big milestone in fuel-efficiency. With lower RPMs it wouldn’t eat as much fuel, because the engine would not be working as hard. The total output of the hybrid system was 134 horsepower, and it was able to achieve 0 to 60 in 9.8 seconds. The Prius was able to hit a massive 51 mpg city and 48 mpg highway, tallying up to 50 mpg combined. Making the Prius yet again a leader in fuel-efficiency on the market. Today, the term “hybrid car” might as well be interchangeable with Prius. It has been a pioneer for the hybrid world, and also has the most sales of any hybrid vehicle ever manufactured. The 2015 model is still the cream of the crop when it comes to fuel-efficiency, with its infamous achievement of 50 mpg combined in 2010 still holding the record. it’s powered by a 1.8-liter engine that gets it around quick enough, and has seen various other packages and upgrades over the years. The 2016 Prius is the most fuel-efficient model to date, yet again causing the other manufacturers to up their game. The C model gets 53 mpg city and 46 mpg highway, the V model getting slightly less but having much more room. Since it was first being tested in 1999, we saw Toyota making changes to ensure the Prius would be successful year after year. The evolution of this hybrid vehicle is astounding, leading in fuel-efficiency since it was first released in America. This evolution is more than just about a car getting better over the years, it’s a statement about perseverance and dedication. A statement that has been burned into the history of the automobile world, and will remain there in seared lettering for years to come. Is Your Connected Car Part of a Government Conspiracy? Previous post: Hyundai Sonata: To Plug-In, Or Not to Plug-In?